We have a new government in Ontario after 15 years of the same party in power. You know what that means? 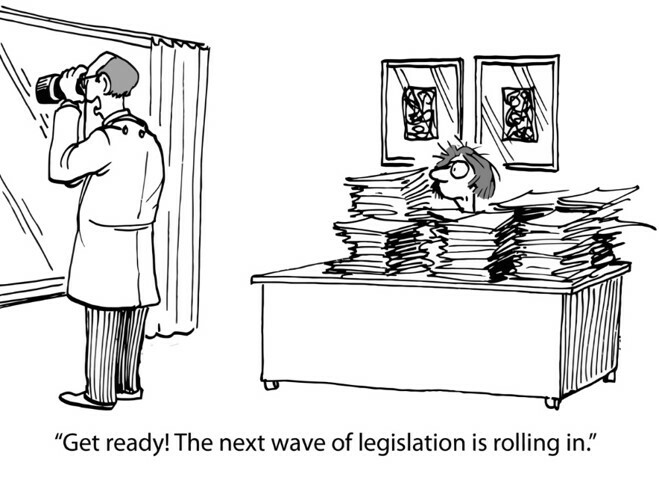 Hold on to your seats folks – we are going to see legislative changes in healthcare in Ontario. Any time of change can be tough. But a time of change is upon us whether we welcome it or not. For health leaders, your agenda should include preparing yourself and your team for changes to the laws that govern your organization. I expect 2019 will be a banner year of legal changes in healthcare. I don’t have a crystal ball to tell you what is going to change to give you a heads start. But, I do have some practical reminders for you to share with your leadership so you have a plan. Join your organizational or professional association: There is always strength in numbers. If you have not done so already, join an association that represents your organization’s interests – such as the Association of Family Health Teams of Ontario or the Ontario Hospital Association or the Alliance for Healthier Communities or the NPLC Association or Addictions and Mental Health Ontario or Children’s Mental Health Ontario or Ontario Long-Term Care Association or Association of Ontario Midwives or other profession-specific associations etc. Associations often get an early heads up before legislation is tabled. Through your association membership you may get early warning signals for new legislation. Consider your advocacy options (to support or oppose or influence): When a new law is tabled, consider whether you can get behind it. Early intervention and storytelling can influence final versions of laws. Implement the mandatory actions: Words like “shall”, “will” or “must” in legislation direct activity that is mandatory. When reading new laws, prioritize the new mandatory activities. Consider what the new world now allows you to do: Words like “may” in legislation indicate discretionary action. New law can offer new opportunities for you to start doing new things or stop doing things. Read between the lines in new laws to find opportunities of what may have changed that now allows you to take action you have been waiting to implement. Update your internal documentation: Any change in law usually means a change to your policies, procedures, by-laws, medical directives and other internal documentation. Update your forms: While most teams remember to update their policies, lots of teams forget to update their forms (such as application forms) to reflect the legal and policy updates. Especially review any forms you offer to the public through your website and orientation packages. Train your team: Not every change in law requires a round of mandatory training. But some changes do. Make sure you explain changes in law to your team members in ways that keep them feeling knowledgeable and confident. Use newsletters or email updates to highlight changes that are systemic that do not necessarily change your team members’ practice – but do impact your patients/clients so that your team is not caught unaware. Communicate with patients and families: When times are tumultuous, healthcare organizations have a roll to play to explain the change to patients and their families. It’s the right thing to do to be prepared to explain new laws – but it also decreases complaints and lawsuits when teams are equipped to educate. Health leaders should look for or create their own resources to communicate big changes to patients and families. Update contracts with vendors: Don’t forget that when there are new laws, old relationships may need to be adjusted. If you are contractually bound to something that does not fit in a new regime, consider whether you need to initiate an early termination of an agreement or negotiate new terms or live with that relationship until its natural expiration and then update the terms. Consider insurance: Talk to your insurance provider about whether your organization needs to expand or review its insurance offerings. How to stay in the know? Subscribe to my newsletter to receive timely legal updates to stay in the know. Read this blog. Follow me on Twitter or LinkedIn. Make sure you are subscribing to your association’s updates. Change is unknown and uncomfortable. But change helps us grow. I’m looking forward to seeing the opportunities that present in our new world order.